fek blog - SAVE CHUCK!!!! As you know from either knowing me or reading the blogs on here I'm a fan of NBC's Chuck. Last night was the Season 2 finale. And what a great finale it was. However there has been a lot of talk that the show will not be back for a third season. 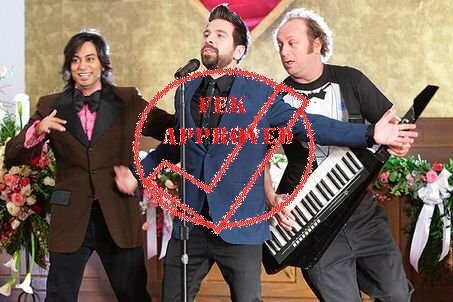 So I am here, much like a lot of us on the interweb, I'm here to voice my opinion and help save Chuck and bring it back for a third season. BOOM! AMERICA!! First off all, the show is amazing. It has everything you could ever ask for in a show, action, romance, comedy, pop culture references, hot chicks (aka Sarah Lancaster & Yvonne Strahovski). It's had a great run of guest stars, not that it needed them, Rachel Bilson, John Laroquette, Jordana Brewster, and Tony Hale to name a few. I personally would like to think (especially in season 2) that the guest stars that were in the show wanted to be in the show and that they were fans. I mean really would Chevy Chase or Scott Bakula do the show if they weren't fans? Well maybe Bakula would, but I don't think Chase would. And how about the supporting cast, aka the Buy More employees. Maybe I just have a soft spot for shows that incorporate people working retail since I did it for so long. But the lines and actions these guys have...just kills me. And none of it is forced, its all flows with the show. And then there is the music. The show has great songs in all of their episodes. The theme song is Cake. There is always some great songs by some indie artists. In the finale alone it had Gramercy Arms and The Thermals. So if you are into the show at all, maybe you could help keep it around. There are petitions and websites and movements all over the interweb. I'll link some towards the bottom and hopefully you can sign up. Thanks for reading this and if you want leave some comments!! !